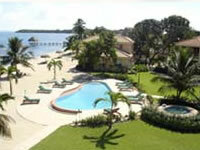 Belizean Dreams is a luxury five stars condominium in Hopkins Village in the Stann Creek District. Located at only 20 minutes by boat from the wonderful Barrier Reef, it is an ideal hotel for scuba diving, snorkeling and fishing. The friendly staff at Belizean Dreams will also assist you with arranging transfers to Hopkins town, which is only five minutes away. In Hopkins many locals still speak the Garifuna language and practice old traditions, such as drumming and dancing Punta, Belize's most popular dance. Belizean Dreams’ 9 Villas are elegantly furnished and located along a beautiful beach. Each Villa features three fully air-conditioning bedrooms, three bathrooms, a full kitchen, living room, dinning room and ocean views. Depending on your needs each Villa can be divided into one, two or three bedroom units. The Executive Suite on the ground level provides two bedrooms, and two bathrooms, a gourmet kitchen, living room, satellite television and CD Player. The one-bedroom second level suites have their private entrance, two balconies with excellent ocean views and a sitting area.